On Tuesday, December 7th, we met with Bob Heim and Lisa Zelig of Boston Digital Editing for a crash course in video production, as many of us are now tasked with creating video content for our websites and social media channels. 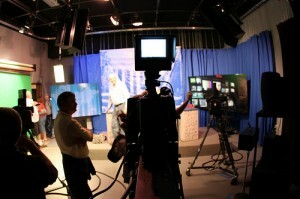 Bob made recommendations on equipment and making the best of different lighting and sound setups. He has forwarded us fifteen tips on a successful shoot, which he has kindly allowed us to post here. Get a tripod and use it. Helps with camera moves. Make sure the camera you have fits on the base of the tripod you have. Only move the camera when you have: 1) a reason and 2) the opportunity. Don’t let needless adjustments ruin your shot. Make sure you have at least 10-20 seconds of usable footage for each piece of B-Roll. All pans and zooms should be slow and controlled. Don’t push record until your shot is perfect. It should be visually interesting and follow the rule of thirds. The rule of thirds is when you imagine your image is divided up like a tic-tac-toe board. The subject’s eyes should be on the top line and their gaze should follow to the other side of the frame (where the interviewer would be). Now that everything is HD, it’s more important to make sure the background of your image doesn’t have anything that shouldn’t be there like extension cords, random paper, etc. Make sure your shot is balanced. When you frame your shot, anticipate what you are editing in. Leave space for things like titles (lower thirds), logos or images in the corners, etc. Check your focus anytime you change focal lengths (zoom in or zoom out) or make a camera move. When you can control it, avoid clothes that have intricate patters, small stripes, and logos. If you are using a green screen, make sure your subject does not wear green. White and black generally don’t read well on camera. White is difficult to light. Have translucent powder/foundation on hand to reduce shine, especially if your subject is bald or oily. Learn your camera menu options. The functions you’ll use the most are white balance, iris (f-stop, how much light comes in the camera), how to switch between 16:9 and 4:3, and how to assign your audio channels. Know how you want the final piece to play out and be consistent with the questions you ask. If you want to multiple subjects to tell a story, make sure you get all of their point of views from beginning to end. Asking subjects the same questions will help with transitions. Don’t go in without a plan. When using a boom, make sure to point it directly at the speaker. Be aware that jostling the boom pole will produce unwanted noise. With a hardwired or a wireless lav make sure it is secured and that there’s no noise. Have the subject remove any jingly jewelry and avoid clothing rustling. It’s better to have the lav visible and picking up clear audio than hidden and picking up clothing noise. Avoid coiling cables or overlapping them with power cords. When all these cables touch it creates buzzing. Always do a sound check to set levels. When you first hit record at the beginning of an interview, allow a moment before you ask the first question. This way the editor has room to work with. The same applies when the question is being answered. This avoids the answer stepping on the interviewer’s next question. Traditional 3-point lighting has a key light, a fill light, and a back light. It looks nice if you can get an eye light, where you see the reflection of the light in the subjects eyes. Make sure the lights don’t overpower the subject. Skin color and clothing color will affect your lighting. There’s a reason that people buy very expensive monitors and don’t rely on their viewfinders. See how it looks to your eye first and foremost. Figure out a system that looks good and follow it as consistently as possible. Make sure your interview subject is in a chair with a non-reclining, upright back. Make sure the chair doesn’t not swivel or have wheels. Have the subject speak directly to the interviewer who should be sitting on either side of the camera. Also have your interviewee include the question in their answer, unless you intend to hear the interviewer asking the questions. It’s a good idea to have them spell out their full name to avoid spelling errors in lower thirds. Make sure you have batteries for your audio as well as for your camera. A pen and paper is always useful. Make sure you have enough tape, the right cables, and any props to dress your set. Label your tapes and keep track of them. Take care of your equipment, it’s expensive. UPDATE 12/10, 11:40 am: Bob’s product recommendations (cameras, lighting kits, etc.) has now been posted in a second entry here. Photo courtesy daveynin on Flickr.